Ubisoft has distributed a new video Tom Clancy’s The Division , and opened a new website, which explains the way the virus came to play jeopardize humanity . Entitled “the collapse begins “ , the trailer puts us in perspective on the precarious security systems and health services , which would be overwhelmed pandemic of this kind. Also, thanks to this video, we know that the pathogen of the game is none other than a mutated strain of smallpox . But there is more. 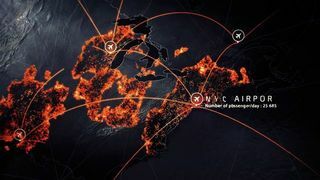 href=”http://collapse-thedivisiongame.ubi.com/es/” Ubisoft allows us to test by a s Realistic imulación taking data how our place of source and location thanks to Google , how the virus is spread in different parts of the world.